Paradise Garden Mink Glitter Wallpaper is a great way to add colour and interest to your walls this season. 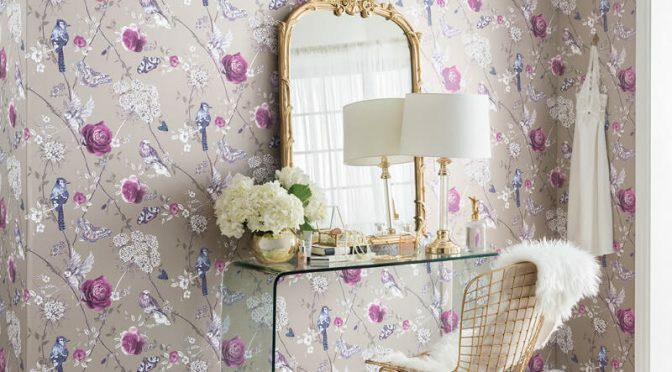 Firstly, this eye-catching wallpaper is inspired by an English garden. It is brought to life as part of the much loved Fantasia Wallpaper Collection by Arthouse. The design features a floral print with bird motifs and features a timeless colour scheme with bursts of pink. Furthermore, a glitter gel finish offers a subtle sparkle effect as it catches the light. Finally, the Arthouse Paradise Garden Mink Glitter Wallpaper is a great way to transform a living or dining room and is versatile enough to be used throughout the room or as a focal point.